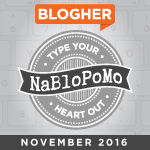 I’m pretty sure my next two or three blog posts will focus on autumn. I can’t help it. I’m obsessed with the beauty of the season. This obsession is not peculiar to me alone, of course. A simple Google search for autumn poems yields pages and pages of links of fall-themed classic and contemporary poetry. And social network feeds proudly showcase an abundance of autumn photos from around the world. If you have children, this poem is perfect for getting them to understand imagery. By the way, Ladybegood included a note telling me a little bit about the photo, but it’s missing in desk clutter (see previous post). Midteacher writes that she passed this tree several times on the way home from work before she made herself stop to take the shot one day. I witness a similar brilliance from my office window every day. The tree beckoned me till one day I was compelled to step onto the balcony to snap a shot. This autumn beauty greets residents and guests at one of the women’s residential halls. My office is quite a distance from the tree, so I plan to take a walk to capture a bit more of the interesting details. I hope there are still leaves on it by the time the temperatures are mild enough for me to take a campus walk. She was so drawn to this breath-taking scene that after they drove passed it, she had her husband go back so she could snap a shot. Midteacher and I are in three photo groups together and I enjoy having her as a swap partner. Her packages are always well-crafted. In fact, I have a couple more sets of her photos to share with my blog audience. Until then, you can check out her work on an earlier post OR check out her blog, A Focused Journey. 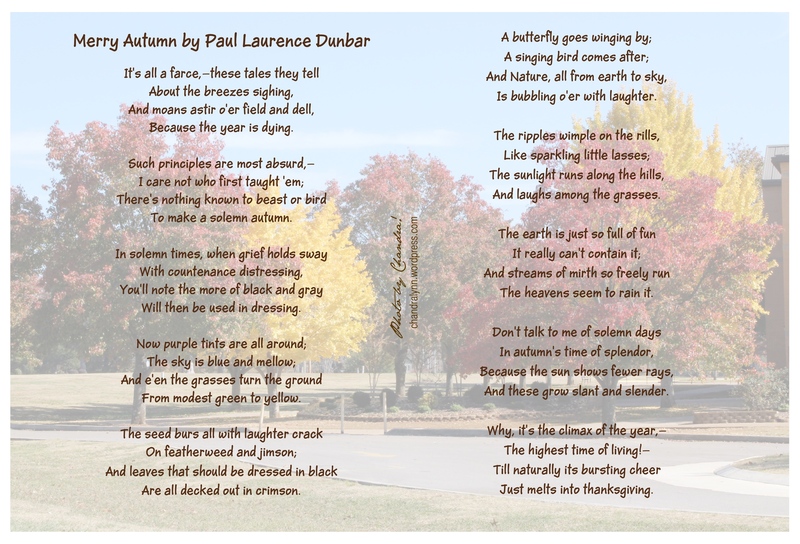 For the “‘Fall’ in Love” swap, I sent my partner, Patty aka Cakers, an envelope full of “red leaves” and a Paul Laurence Dunbar poem that so clearly illustrates my giddiness about autumn that I had to send it to her [click image for a closer look]. Patty loved her envelope full of autumn. In return, with her permission, of course, I “swiped” a photo from her Facebook wall–of leaves she collected during an afternoon walk. Happy Belated World Postcard Day! Happy Belated National Postcard Week! Oh Gosh! The beauty of this autumn was beyond words! I don’t remember the last time we had such a perfect fall here in the midwest. I love to take pictures of the trees as they bare their true beauty. What a wonderful group of pictures and poetry. I especially love the picture the fifth picture, “Brilliant Hello” – that color just lights things up. I drive through an area that is full trees that turn brilliant colors in autumn – 90% of my short drive to work. One day when it was overcast and nearing dusk, the trees glowed and it was brighter than it normally would have green.